The Palestinian Prisoners’ Society (PPS) has confirmed that Israeli soldiers abducted, on Thursday at dawn, sixteen Palestinians, after invading and ransacking their homes, in several parts of the occupied West Bank. The Qalqilia office of the PPS, in northern West Bank, said dozens of soldiers invaded and violently searched homes in the city, and in Azzoun town, east of Qalqilia, before abducting Moath al-Far, from Qalqilia, in addition to Mohammad Faisal Salim, 26, and Mohammad ‘Adel Shbeita, from ‘Azzoun. Furthermore, the soldiers invaded many homes in Jenin city, and Jenin refugee camp, in northern West Bank, and abducted Emad Abu al-Haija, and Osama Wasfi Kabaha, from the refugee camp, in addition to Mohammad Zakarna, from Jenin. It is worth mentioning that Osama is the son of the imprisoned former government minister, Wasfi Kabaha. in addition, the Nablus office of the PPS, also in northern West Bank, said the soldiers violently searched many homes, and abducted eight Palestinians, identified as Emad Mustafa Reehan, Ramadan Nayef Silwadi, Jihad Ibrahim Eshteyya, Hamed Ibrahim Awad Ramadan, Ahmad Ibrahim Othman Ramadan, Qassem Yousef Ibrahim Ramadan, Ahmad Yousef Ramadan, and Jihad Hassan al-Hindi. In Qalandia, north of occupied Jerusalem, the soldiers searched a few homes, and abducted one Palestinian, identified as Ibrahim ‘Adawi. In addition, the soldiers invaded the al-Jalazoun refugee camp, north of Ramallah in central West Bank, searched homes and abducted Ahmad Amer Dabbour. 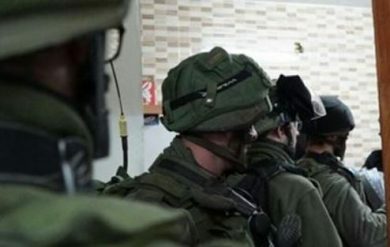 The soldiers also invaded Deir Istiya village, east of Salfit, in northwestern West Bank, and violently searched several homes while interrogating many Palestinians, and inspecting their ID cards. In related news, the soldiers invaded and ransacked dozens of homes in Beit Ummar and Yatta towns, in the southern West Bank governorate of Hebron. On Wednesday evening, the soldiers abducted two children near the northern entrance of the West Bank city of Bethlehem. Also on Wednesday evening, undercover Israeli soldiers kidnapped a young man, after intercepting his car, and forcing him out of it at gunpoint, in the western part of Nablus.